The director of CEDENNA (Universidad de Santiago de Chile’s Center for Development of Nanoscience and Nanotechnology), Dora Altbir, said the conference will link Chilean students and young researchers with the most cutting-edge nanotechnology today and allow them to connect with leading scientists. But broadening the study demands heftier investment. Chile allots US$4 million annually to develop nanotechnology. Comparatively, the United States and the European Union spend about US$3.7 trillion and US$1.2 billion respectively. Brazil spends US$1 billion. Chilean politicians, the gatekeepers of public funds, often mention their goal for Chile to become a developed nation by 2016. Dangling a carrot, Altbir champions nanoscience as a field where Chile could distinguish itself in the scientific community and as a developed nation. The conference led by the Center for the Development of Nanoscience and Nanotechnology (CEDENNA) of the Universidad de Santiago de Chile will bring together leading academic scientists, researchers and students from Europe, Asia and the Americas to exchange and share their experiences and results on diverse themes related to this groundbreaking field of science. The first week of June, the eyes of the scientific world will be focused on “the navel of the world” (Te Pito or Te Henua) given that for the first time an International Conference on Nanoscience and Nanotechnology, EINC 2013, will take place on Easter Island. That a Conference will be held in Easter Island is no small thing. At present nanoscience and nanotechnology are at the center of groundbreaking research around the world owing to the fascinating advances that basic science is achieving in this area and the technological benefits they bring. The Easter Island Conference on Nanoscience (EINC2013) will bring together in Chile world-class scientists from the fields of physics, chemistry and the material sciences to share their knowledge and discuss their research in nanoscience and nanotechnology. The conference, which will take place June 4 – 8, 2013, will include the participation of two Nobel Prize winners and around 100 academic scientists, researchers and students from three continents. I am delighted to be able to publish something about Chile and nanoscience. I have this is the first of many future mentions. You can find out more about EINC2013 here. This entry was posted in nanotechnology and tagged CEDENNA, Center for the Development of Nanoscience and Nanotechnology, Chile, Claude Cohen-Tannoudji, Dan Shechtman, Dora Altbir, Easter Island, Easter Island Conference on Nanoscience, EINC2013, Kate Manning, Kornelius Nielsch, Myriam Sarachick, Universidad de Santiago de Chile on May 31, 2013 by Maryse de la Giroday. You must register to attend the event. No RSVP is required to view the webcast. When: June 3, 2013 from 3:00 p.m. – 5:00 p.m.
Who:Heather Dewey-Hagborg, Information Artist and Ph.D. Candidate at Rensselaer Polytechnic Institute; Professor Sonia M. Suter, George Washington University Law School; Nancy J. Kelley, JD, MPP; Founding Executive Director of the New York Genome Center; a representative from the FBI is tentatively scheduled to discuss their methods and protocols surrounding DNA collectionand analysis. Dr. Todd Kuiken and Eleonore Pauwels of the Synthetic Biology Project will moderate the session. It was not immediately apparent to me that this event is being held as part of the Center’s Synthetic Biology Project event series. Interesting approach to bioethical and other issues. … Heather Dewey-Hagborg, a 30-year-old Ph.D. student studying electronic arts at Rensselaer Polytechnic Institute in Troy, N.Y., has the weird habit of gathering the DNA people leave behind, from cigarette butts and fingernails to used coffee cups and chewing gum. She comes to Genspace to extract DNA from the detritus she collects and sequence specific genomic regions from her samples. The data are then fed into a computer program, which churns out a facial model of the person who left the hair, fingernail, cigarette, or gum behind. Using a 3-D printer, she creates life-sized masks that offer a depiction of what the anonymous DNA donor might look like. And they may be coming to a gallery wall near you, with a show at the New York Public Library slated for early 2014. … To what extent do genetic traits (such as ancestry) tell you about how a person looks? Based on the analysis of these genetic traits, how accurate is the 3-D facial model produced by the computer? At the request of a Delaware forensic practice, Dewey-Hagborg has been working on a sculpture from a DNA sample to identify the remains of an unidentified woman. This opens another black box at the connection between law enforcement and what we might call “DIY forensic science”: Here, what is the role of the state versus that of the individual? I recommend reading the commentary in its entirety. As for the questions Pauwels raises, I’m wondering how I’d feel if I saw a mask that l00ked like me at the New York Public Library in 2014. Of course, that begs the next question, would I recognize myself? This entry was posted in synthetic biology, Visual Art and tagged art/science, Eleonore Pauwels, Heather Dewey-Hagborg, Science and Technology Innovation Program, Sonia Suter, Stranger Visions: The DNA You Leave Behind, Symthetic Biology Project, Todd Kuiken, Woodrow Wilson International Center for Scholars on May 31, 2013 by Maryse de la Giroday. Subconscious Password, my latest short film, travels to the inner mind of a fellow named Charles Langford, as he struggles to remember the name of his friend at a party. In his subconscious, he encounters a game show, populated with special guest stars: archetypes, icons, distant memories, who try to help him find the connection he needs: His friend’s name. The film is a psychological romp into a person’s inner mind where (I hope) you will see something of your own mind working, thinking, feeling. Even during a mundane act like remembering the name of an acquaintance at a party, someone you only vaguely remember. To me, mundane accomplishments like these are miracles we all experience many times each day. Recently there are many industrial robots, and as we know the robots do not have a face or legs, and just rotate or extend or contract their arms, and they bear no resemblance to human beings. Certainly the policy for designing these kinds of robots is based on functionality. From this standpoint, the robots must perform functions similar to those of human factory workers, but their appearance is not evaluated. If we plot these industrial robots on a graph of familiarity versus appearance, they lie near the origin (see Figure 1 [above]). So they bear little resemblance to a human being, and in general people do not find them to be familiar. But if the designer of a toy robot puts importance on a robot’s appearance rather than its function, the robot will have a somewhat humanlike appearance with a face, two arms, two legs, and a torso. This design lets children enjoy a sense of familiarity with the humanoid toy. So the toy robot is approaching the top of the first peak. Of course, human beings themselves lie at the final goal of robotics, which is why we make an effort to build humanlike robots. For example, a robot’s arms may be composed of a metal cylinder with many bolts, but to achieve a more humanlike appearance, we paint over the metal in skin tones. These cosmetic efforts cause a resultant increase in our sense of the robot’s familiarity. Some readers may have felt sympathy for handicapped people they have seen who attach a prosthetic arm or leg to replace a missing limb. But recently prosthetic hands have improved greatly, and we cannot distinguish them from real hands at a glance. Some prosthetic hands attempt to simulate veins, muscles, tendons, finger nails, and finger prints, and their color resembles human pigmentation. So maybe the prosthetic arm has achieved a degree of human verisimilitude on par with false teeth. But this kind of prosthetic hand is too real and when we notice it is prosthetic, we have a sense of strangeness. So if we shake the hand, we are surprised by the lack of soft tissue and cold temperature. In this case, there is no longer a sense of familiarity. It is uncanny. In mathematical terms, strangeness can be represented by negative familiarity, so the prosthetic hand is at the bottom of the valley. So in this case, the appearance is quite human like, but the familiarity is negative. This is the uncanny valley. Follow the curvy line from the lower left. If a character is simple (like a stick figure) we have little or no empathy with it. A more complex character, like Snow White orPixar’s Mr. Incredible, gives us more human-like mannerisms for us to identify with. 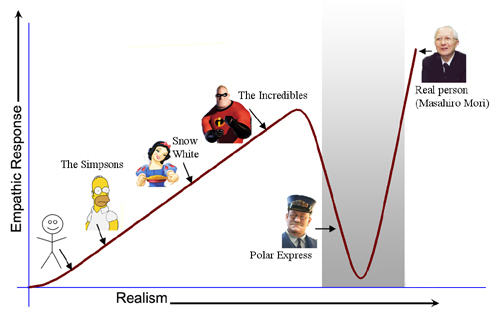 You’ll notice that the diagram from my posting features a zombie at the very bottom of the curve. … The value of land in the Uncanny Valley has plunged to zero. There are no buyers. Some of you know that my films have a certain obsession with visual realism with their human characters. I like doing this. I find value in this realism that goes beyond simply copying what humans look and act like. If used intelligently and with imagination, realism can capture something deeper, something weird and emotional and psychological about our collective experience on this planet. But it has to be honest. That’s hard. When making this film, we knew we were going into the Uncanny Valley. We did it because your subconscious processes, and mine, are like this valley. We project our waking world into our subconscious minds. The ‘characters’ in this inner world are realistic approximations of actual people, without actually being real. This is the miracle of how we get by. My protagonist, Charles, has a mixture of both realistic approximations and crazy warped versions of the people and icons in his life. He is indeed a bit off-kilter. But he gets by, like most of us do. As you probably have guessed, both Charles and the Host are self-portraits. I want to be honest in showing you this world. My own Uncanny Valley. You have one too. It’s something to celebrate. I last wrote about Landreth and his work in an April 14, 2010 posting (scroll down about 1/4 of the way) regarding mathematics and the arts. This post features excerpts from an interview with the University of Toronto (Ontario, Canada) mathematician, Karan Singh who worked with Landreth on their award-winning, Ryan. This entry was posted in Mathematics, movies, New Media and tagged Charles Langford, Chris Landreth, Karan Singh, Masahiro Mori, National Film Board of Canada, Subconscious Password, uncanny valley on May 31, 2013 by Maryse de la Giroday. Eleven EU-funded nanotechnology projects have been shortlisted for the “Best Research Project Award” to be announced at the next EuroNanoForum (ENF2013), Europe’s largest Nanotechnology and Materials Conference, in Dublin. The aim of the award is to highlight the innovative outcomes of EU research projects and to present how nanotechnologies enable progress in every aspect of daily life: from health to environment, energy, transport, food and communication. The 11 candidates will be voted on and a winner announced at the ENF2013 on 20 June 2013. BioElectricSurface; Electrically Modified Biomaterials’ surfaces: From Atoms to Applications. EUMET; Design, Development, Utilization and Commercialisation Of Olefin Metathesis Catalysts. FEMTOPRINT; Develop a printer for microsystems with nano-scale features fabricated out of glass. FLEXONICS; Ultra-high barrier films for r2r encapsulation of flexible electronics. IP NANOKER; Structural ceramic nanocomposites for top-end functional applications. LIGHT-ROLLS; The development of a roll-to-roll production platform for the manufacturing of micro-structured flexible LED displays – “Light where you want it” The future of retail lighting. MUST; Multi-Level Protection of Materials for Vehicles by Smart Nanocontainers. NanoInteract; The aim of NanoInteract was to ensure that nanotechnologies do not cause inadvertent harm to human or environmental health at any stage of their lifecycle. NANOTHER; Integration of novel NANOparticle based technology for THERapeutics and diagnosis of different types of cancer. Sonodrugs; Image-Controlled Ultrasound Induced Drug Delivery. STONECORE; The use of nanotechnology materials for the refurbishment of buildings as well as the conservation of natural and artificial stone, plaster and mortar. Over 50 projects have been submitted for the Best Research Project 2013 covering the areas of Industrial Technologies, Life Sciences, Environment, Energy and Transport. At the Award Gala, the spotlight will be on the 11 finalists who will have the opportunity to present their achievements on stage and to the gala attendees. There will then be a live ballot at the Gala Dinner to identify the winner of the prestigious Best Research Project Award 2013. That live ballot at the Gala Dinner is going to make this a very exciting evening for all the finalists. I wonder what kind of politicking the attendees will be subject to. This entry was posted in Uncategorized on May 31, 2013 by Maryse de la Giroday. Today we constantly switch from one text to another: news, blogs, email, workplace documents and more. But a new book by an MIT [Massachusetts Institute of Technology] professor reveals that this is not a new practice: In the 14th century, for instance, many people maintained eclectic reading habits, consuming diverse texts in daily life. Consider Andrew Horn, the chamberlain for the city of London in the 1320s—meaning he was essentially the lawyer representing London’s interests in court against the king, who was Edward II for most of that time. The bound manuscripts in Horn’s possession, handed down to the city and preserved today, reveal a rich mixture of shorter texts: legal treatises, French-language poetry, descriptions of London and more. Perusing such diverse texts, within bound volumes, was all in a day’s reading for a well-educated person, asserts Arthur Bahr, a professor of literature at MIT. Now in his book “Fragments and Assemblages,” published by the University of Chicago Press, Bahr says we must reconstruct how medieval people compiled these bound volumes in order to best grasp how they thought and wrote. When we realize that individuals read this way, Bahr notes, we can see that the practice of throwing together all kinds of texts in a single bound manuscript may have influenced the composition of the most famous piece of literature of the period, Geoffrey Chaucer’s late-14th-century work “The Canterbury Tales,” a rich collection of linked stories. To see why readers 700 years ago jumped between texts so much, recall that this was prior to the invention of the printing press, which was introduced in Europe in the middle of the 15th century. Before single books could be mass-produced more easily, manuscripts were copied out by hand, then bound together. This process led people to have many different types of texts bound together, rather than a single text being the entirety of a bound volume. But Horn was not just throwing a bunch of texts together and expecting readers to bounce around wildly from one to another, Bahr observes. He had a deliberate method to his assemblages of texts. In the book, Bahr looks at additional 14th-century manuscripts that compiled works of many authors, but also reinterprets Chaucer through the lens of these reading practices. “Chaucer is able to conceive of the literary project that he undertakes in large part because those early figures created a literary culture that was attuned to these sorts of textual juxtapositions within literary manuscripts,” Bahr says. That last bit sounds remarkably like some descriptions of digital novels and other ‘experimental’ work being done in what is sometimes called ‘new media’. The whole thing brings to mind, Baroness Susan Greenfield, a British neuroscientist, who regularly forecasts ruin in the wake of new, mind-altering technologies such as Facebook and Twitter. I imagine that if the book were a new technology today, she would find it just as disturbing. Following her recent article about the potential neurological dangers of the newly announced “Facebook phone”, it’s becoming increasingly likely that any new technological development will eventually have an article about it in which Susan Greenfield predicts the serious damage it could do to people’s brains. Overlooking the fact that the recent article reads as though it was written by someone whose understanding of Facebook and smartphones is based exclusively on an overheard conversation between two drunken advertising executives in a pub, Greenfield tends to stick to a reliable and predictable formula. Technological advances usually focus on making things faster, slicker and more efficient. So, should you need a Greenfield-esque article about the latest technological announcement to make your needless paranoia-inducing agenda seem more scientific/credible, there’s no need to wait until the Baroness herself can fit you into her schedule. Now you can write your own by following this simple step-by-step guide. I highly recommend reading both Dizikes’ news release and Burnett’s posting in their entirety. ETA May 31, 2013 1:10 pm (PDT): There is another article about Arthur Bahr and his latest book, Fragments and Assemblages, which describes the work in more depth. Medieval reading lessons by Kathryn O’Neill for MIT. This entry was posted in New Media, writing and tagged Andrew Horn, Arthur Bahr, Baroness Susan Greenfield, Chaucer, Dean Burnett, Fragments and Assemblages, Massachusetts Institute of Technology, MIT, Peter Dizikes on May 31, 2013 by Maryse de la Giroday. Instead of through pigments, these ‘polymer opals’ get their colour from their internal structure alone, resulting in pure colour which does not run or fade. The materials could be used to replace the toxic dyes used in the textile industry, or as a security application, making banknotes harder to forge. Additionally, the thin, flexible material changes colour when force is exerted on it, which could have potential use in sensing applications by indicating the amount of strain placed on the material. The most intense colours in nature – such as those in butterfly wings, peacock feathers and opals – result from structural colour. While most of nature gets its colour through pigments, items displaying structural colour reflect light very strongly at certain wavelengths, resulting in colours which do not fade over time. In collaboration with the DKI (now Fraunhofer Institute for Structural Durability and System Reliability) in Germany, researchers from the University of Cambridge have developed a synthetic material which has the same intensity of colour as a hard opal, but in a thin, flexible film. Naturally-occurring opals are formed of silica spheres suspended in water. As the water evaporates, the spheres settle into layers, resulting in a hard, shiny stone. The polymer opals are formed using a similar principle, but instead of silica, they are constructed of spherical nanoparticles bonded to a rubber-like outer shell. When the nanoparticles are bent around a curve, they are pushed into the correct position to make structural colour possible. The shell material forms an elastic matrix and the hard spheres become ordered into a durable, impact-resistant photonic crystal. “Unlike natural opals, which appear multi-coloured as a result of silica spheres not settling in identical layers, the polymer opals consist of one preferred layer structure and so have a uniform colour,” said Professor Jeremy Baumberg of the Nanophotonics Group at the University’s Cavendish Laboratory, who is leading the development of the material. Like natural opals, the internal structure of polymer opals causes diffraction of light, resulting in strong structural colour. The exact colour of the material is determined by the size of the spheres. And since the material has a rubbery consistency, when it is twisted and stretched, the spacing between spheres changes, changing the colour of the material. When stretched, the material shifts into the blue range of the spectrum, and when compressed, the colour shifts towards red. When released, the material will return to its original colour. I find the potential for use in the textile industry a little more interesting than the anti-counterfeiting application. (There’s a Canadian company, Nanotech Security Corp., a spinoff from Simon Fraser University, which capitalizes on the Blue Morpho butterfly wing’s nanoscale structures for an anti-counterfeiting application as per my first posting about the company on Jan. 17, 2011.) There has been at least one other attempt to create a textile that exploits structural colour. Unfortunately Teijin Fibres has stopped production of its morphotex, as per my April 12, 2012 posting. The technology could also have important uses in the textile industry. “The World Bank estimates that between 17 and 20 per cent of industrial waste water comes from the textile industry, which uses highly toxic chemicals to produce colour,” said Professor Baumberg. “So other avenues to make colour is something worth exploring.” The polymer opals can be bonded to a polyurethane layer and then onto any fabric. The material can be cut, laminated, welded, stitched, etched, embossed and perforated. The researchers have recently developed a new method of constructing the material, which offers localised control and potentially different colours in the same material by creating the structure only over defined areas. In the new work, electric fields in a print head are used to line the nanoparticles up forming the opal, and are fixed in position with UV light. The researchers have shown that different colours can be printed from a single ink by changing this electric field strength to change the lattice spacing. Cambridge Enterprise, the University’s commercialisation arm, is currently looking for a manufacturing partner to further develop the technology and take polymer opal films to market. For more information, please contact sarah.collins@admin.cam.ac.uk. The reference to opals reminded me of yet another Canadian company exploring the uses of structural colour, Opalux, as per my Jan. 31, 2011 posting. This entry was posted in biomimcry, business, nanotechnology and tagged blue morpho butterfly, Fraunhofer Institute, Jeremy Baumberg, jewel beetles, morphotex, NanoTech Security Corp, Opalux, polymer opals, synthetic opals, Teijin Fibers Limited, textiles, University of Cambridge on May 30, 2013 by Maryse de la Giroday. Lomiko Metals, batteries, graphite/graphene, and a strategic alliance with the Research Foundation of Stony Brook University and Graphene Laboratories, Inc.
Lomiko Metals, a Vancouver-based (Canada) company, has been mentioned here with respect to a property in Québec (Quatre Milles) containing graphite flakes in an April 17, 2013 posting, which also mentioned the company’s strategic alliance with Graphene Laboratories Inc. Under its Strategic Alliance Agreement with Lomiko, Graphene Labs — a leading graphene manufacturer — will process graphite samples from Lomiko’s Quatre Milles property into graphene. The Research Foundation, through Stony Brook University’s Advanced Energy Research and Technology Center (AERTC) and the Center for Advanced Sensor Technology (Sensor CAT), will then examine the most efficient methods of using this graphene for energy storage applications. There is no certainty the roposed [sic] operaton [sic] will be economically viable. Located in the Research and Development Park on the campus of Stony Brook University, the Advanced Energy Incubator is space that is home to companies within the Advanced Energy Center. The Advanced Energy Center (www.aertc.org) is a true partnership of academic institutions, research institutions, energy providers and companies. Its mission is innovative energy research, education and technology deployment with a focus on efficiency, conservation,renewable energy and nanotechnology applications for new and novel sources of energy. The New York State Center for Advanced Technology at Stony Brook University provides intellectual, logistical, and material resources for the development of new product technologies – by facilitating R&D partnerships between New York companies with an in-state footprint and university researchers. The important outcomes are new jobs, new patents, training of students in company product matters, and improved competitiveness for New York State businesses. The highlight of Lomiko’s testing was nine (9) sieve samples which captured flakes of varying sizes which tested 100.00% carbon. Both fine and flake material may be amenable to graphene conversion by Lomiko Metals Inc. partner Graphene Laboratories. I couldn’t resist that last bit either. As I understand it, this means ‘caveat emptor’ or buyer beware. In short do your research. This entry was posted in graphene, mining, nanotechnology, Vancouver and tagged batteries, BC, British Columbia, Canada, Graphene Laboratories, Graphene Labs, graphite, Lomiko Metals, New York State, Quatre Milles, Quebec, Research Foundation of Stony Brook University, Stony Brook University on May 30, 2013 by Maryse de la Giroday. Greetings from the Player’s Theatre! We’ve spent the past two days setting up not one but three shows here, preparing for the world’s first-ever hip-hop theatre cycle: Evolutionary Tales. We launch on Friday with a performance of Ingenious Nature, which was recently nominated for an Off-Broadway Alliance Award in the category of “Best Unique Theatrical Experience” (which we didn’t win, but it was a nice acknowledgement). Use the code “Genious” to get $29 advance tickets. Then on Saturday we’re taking the “peer-reviewed rap” theme to the next level, with a World Science Festival presentation of the Rap Guide to Evolution featuring Dr. Helen Fisher, Dr. Stuart Firestein, and Dr. Heather Berlin providing a live post-show peer-review talkback. Use the code “Darwin” for discount tickets. Finally, on Sunday the Canterbury Tales Remixed will have its first off-Broadway performance since early 2012, tracing the evolution of storytelling from Gilgamesh to Slick Rick via Chaucer’s masterpiece. Use the code “Tales” for discount tickets. This link will take you to the calendar where you select the show(s) you’d like to attend and click through to purchase one or more tickets. I’m fascinated by the idea of live science peer-review onstage. I imagine that too is a world first, along with the hip-hop theatre cycle. I wish Baba and all his collaborators the best of luck. This entry was posted in Music, performing arts, poetry, science and tagged Baba Brinkman, Beowulf, Canterbury Tales Remixed, Chaucer, Evolutionary Tales, Gilgamesh, Heather Berlin, Helen Fisher, hip hop, Ingenious Nature, Rap guide to evolution, Stuart Firestein on May 30, 2013 by Maryse de la Giroday.